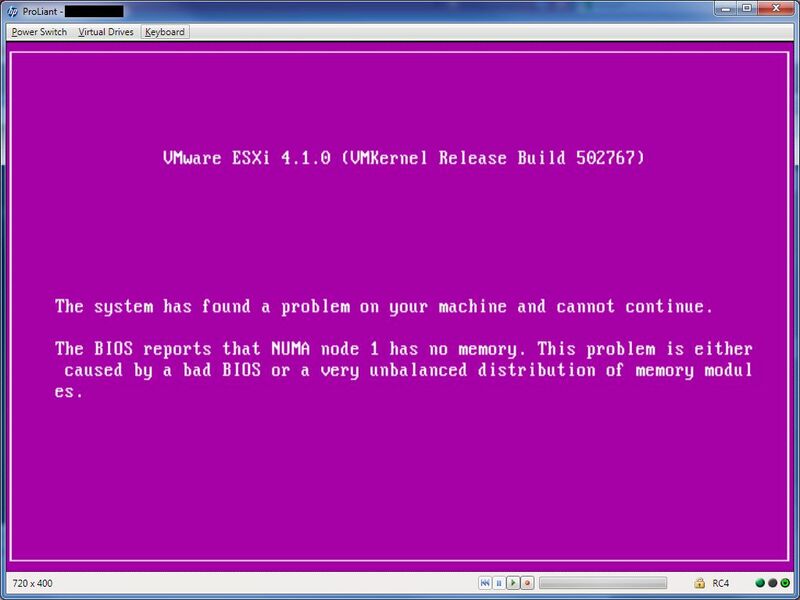 This week I was presented with the following PSOD boot error while trying to install ESXi 4.1 on a new host. It was a new HP Blade node with an added CPU but with the default amount of RAM. So it ended up with 3 banks filled with 2GB DIMMs on 1 NUMA node. It seemed the NC553i CNA had no driver installed. No problem, I downloaded the driver CD here. However, this 4.0.306.0 driver is newer then the one installed on the other ESXi hosts. It seems there are 3 other versions, 2.104.277.3 , 2.102.554.0 and 2.102.518.0 available for download and at the moment our ESXi hosts run the oldest version. We decided to install the newest driver and use this as a test case. We don’t expect any problems because this driver is 6 months old now and it has gone through rigorous testing before recieving the ‘VMware certified’ stamp. First, extract the downloaded .iso file and copy the EMU-be2net-4.0.306.0-offline_bundle-473366.zip to your vMA using SCP. When the installation is finished, reboot the host. I used the vSphere client for convenience. you can see what driver is being used. You can clearly see the difference in driver version and even firmware version in the screenshots below. We’ll continue to test these newer versions until we’re statisfied we can update all hosts. Before we do this, however, both versions and the combination of the two, should be available in the VMware HCL. ATM they are not. Please note this and this if you’re using VMware ESXi 5.0! 2012-03-05 14:34:15:667 1024 2748 Misc WARNING: Send failed with hr = 80072efd. After some Googling it was clear it had something to do with the network. But after all usual network troubleshooting I wasn’t any closer to a solution. I decided to check the IIS server and finally got a bright moment. I installed the WSUS server on a clean Windows Server 2008 R2 SP1 installation. But I the old server has many services installed. Thus the new WSUS website was installed in IIS on port 80 while the old server was using port 8530. And because I copied the GPO and only adjusted the FQDN, it was still pointing to port 8530! Instead of adjusting the GPO, I decided to bind the WUS website to port 8530 too. This way, when migrating to the new WSUS server, only the FQDN had to be changed. I now got this documented, so I hope I will never waste another minute on this.